The 32 year old international fitness and aerobic academy from Europe – Germany, which began its operations and international certifications in India a year ago, invited master trainers from all around the world consecutively for the second time to educate, train and upgrade the fitness knowledge of all those who attended the Personal Trainer Summit and Group Fitness Explosion. Kezban Klein, Director of IFAA India said, the primary goal of this convention was to bring all the fitness enthusiasts, trainers, instructors and Club owners under one roof and offer a platform to share and learn about fitness in general and upgrade their knowledge on new fitness trends and programs in the industry. Split in two huge halls with a capacity of 150 participants per Hall IFAA offered a spectacular line up of more than sixty different workout classes for the participants. More than 500 participants enjoyed the three action packed days of back to back trainings conducted by Masters Trainers from all around the globe. Kez Klein: Event Partners like Reebok, Reebok Fitness Equipment, Precor, Ritebite and Venky’s Sports Nutrition supported us with their products during the IFAA Convention Part 2. We are sincerely thankful to be associated with these partners who not only believe that this is one of the best forums to market their products but also are equally excited to be part of an event like this. The convention started at 9 am on the 1st October 2015. Upon arrival the participants were greeted at the registration desk by the IFAA team and were handed their entry bands along with the IFAA goody bag. The first day of the convention began with a six hour functional training course led by one of the IFAA Master Trainer Rebecca Barthel (WORLDCHAMPION 2015 W.A.B.B.A., MISS BODY FITNESS, MISS TRAINED FIGURE HERCULES OLYMPIA 2015, MISS HERCULES OLYMPIA ALL OVER 2015, GERMAN CHAMPION 2015 W.A.B.B.A.) which consisted of the two training trends from Europe called Soccasice ® Athletic and M.A.X. ® Muscle –Activity – Excellence, which are trainings designed primarily with functional training movements and principles. IFAA India is also in the process of introducing functional training instructor certificates for trainers who wish to upgrade and enhance their skills when it comes to functional training in Gyms, Health Clubs and functional training facilities in India. Kezban Klein: The trend of functional training is popping up everywhere currently in the fitness industry and its diversified range of workouts certainly offer a refreshing new routine when compared to the monotonous machines workouts in the gym. We are also receiving multiple requests from various gyms across the county to train their teams in this particular field. 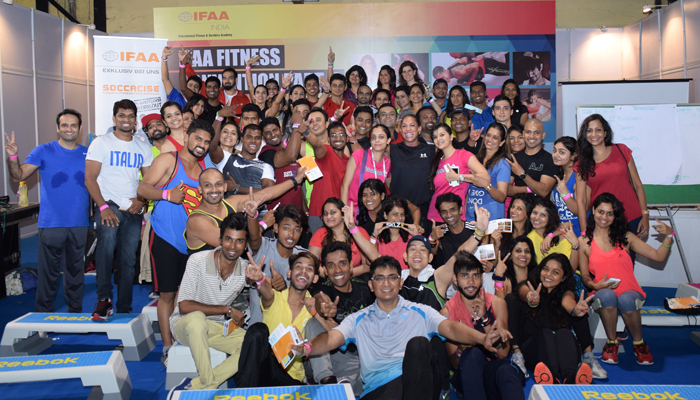 On the second and third day of the convention, Presenters and IFAA INDIA Master trainers offered both theoretical and practical knowledge of some new fitness trends and programs to their guests. A few classes practical classes conducted were as follows: Olympic Weight Lifting, Kettle Bells, Foam Rolling, Plyometrics, MMA Conditioning, different dance programs like Zumba ® and Folka Fitness. The Master trainers also shared their knowledge on topics such as like Acute Injury Management, Communication Skills, how to keep a client motivated with his workouts etc., via theoretical sessions. These were not only presented due to public demand but are also essential subjects in the life of a Personal Trainer or an Instructor. We at IFAA firmly believe that the interpersonal skills of a trainer are as important as his technical knowledge. IFAA also announced a schedule of its upcoming trainings and international certifications for the next 6 months which will be conducted in different Cities across India. The different training programs are perfectly designed for beginners as well as experienced professionals in the fitness field. For e.g., The Basic Fitness Certifications or the C License training will help a person understand the most basic aspects of fitness in an easy way and also provide a head start into his/her fitness career. Topics like Anatomy, physiology, planes of movement, Active and Passive Musculoskeletal system, Super compensation model, Training structure and stimuli will be taught during the three days of training followed by a one hour written examination at the end of it. Only participants who successfully pass the examination will be awarded an International Certificate representing the completion of this course. Health Clubs from different cities have already collaborated with IFAA to get their technical teams trained and certified with the right knowledge to become a good fitness or personal trainer. IFAA not only specializes in technical training but also has state of the art training and consultation programs for the operations team too. We also support Clubs and business owners to be on the right track with numbers and optimize their revenue streams with trainings such as License to sell or sales training, Soft skills training, Communication Training, Marketing and lead generation, Customer engagement and satisfaction programs, Revenue optimization programs, Strategic decisions, Time Management etc. Kezban Klein: A BIG THANK YOU to all the Participants, Partners, Sponsors, Presenters and Ambassadors for making the IFAA Convention Part 2, once again, a great success. To catch all the exiting news from IFAA India and be up to date on all the new trends in the fitness industry follow us on Facebook IFAA India and find more information on www.ifaa-india.com. During the Convention we introduced our Company Slogan and it was in everyone’s mouth and I like to end this interview with it. Rock’n’Move.